Please join me tomorrow, Saturday February 27th from 10-11AM at FCRC Headquarters 4246 Chain Bridge Road, Fairfax 22030 at a rally for Kerry Bolognese. It is essential that we work this weekend to elect our outstanding candidates in the March 2nd (next Tuesday!!) special elections. Kerry Bolognese (41st House of Delegates) and Samantha Rucker (Mason District School Board) are both principled conservatives, but they need our support in order to win. By attending the rally and volunteering afterward - we can ensure that we increase our majority in the House of Delegates. Don't forget, if you live outside Fairfax, you can help by calling from home. Please visit Fairfax GOP today to find out how you can help. Thank you, and please respond to this email and let me know if we can count on you attending the rally tomorrow! State Del. Morgan Griffith’s campaign for Congress became official this morning when the Salem Republican filed as a candidate for the GOP nomination in the 9th Congressional District. Griffith said he sent a letter and $500 filing fee this morning that will make him a candidate for the Republican nomination, which will be decided at a May 22 convention. Griffith already had formed a federal campaign committee and has been lining up support from party leaders in the sprawling district. "Earlier today, Michelle Jenkins, Chairman of the 9th District Republican Committee, received a signed statement from me declaring that I will be a candidate for the Republican nomination for Congress from Virginia's 9th District. She also received from me the candidate filing fee, as required by the Convention Call issued by the Committee. "The acceptance of this form and fee means that I am qualified to seek the Republican nomination for Congress at the 9th District Republican Convention on May 22 at Fort Chiswell High School in Max Meadows. "The General Assembly is scheduled to be in session for another two weeks, so my duties as Majority Leader will delay a formal public announcement of my candidacy until after we have adjourned for the year." House Majority Leader H. Morgan Griffith (R-Salem) represents the Eighth District in the Virginia House of Delegates. The Eighth District is comprised of the City of Salem and portions of Roanoke County. For those who thought today's Health Care Summit at the Blair House would be Obama, Reid, and Pelosi's show you were proven wrong. Today belonged to the GOP proving that we are not the party of "no" but a party with solutions. Specifically Rep. Paul Ryan of Wisconsin took the day in what could be remembered as the day he really and truly became on of the GOP's brightest young stars. Many Republicans thought that after the President overshadowed the GOP at their Baltimore retreat last month, going to Blair House yesterday would just be another PR disaster. For those who didn't see this portion, which came in the afternoon session, Ryan launched a full on assult on the bill more or less talking about how the bill will greatly increase the deficit which is something the Dems have lied about time and time again. Additionally he hits on the fact that medicare is broke, how this bill will hurt seniors as well as future generations, and quoting a budget chairman who said this bill was a "ponzi scheme that would make Bernie Madoff proud". Obama didn't even bother questioning Ryan's presentation. He changed the subject to Medicare Advantage. The expression on the president's face as Ryan made his case was absolutely priceless. Simply put, he looked like someone who realizes he's met his match. Here's Ryan from earlier in the day where he talks about the essential difference in philosophy between the Dems and Republicans as they go about trying to achieve health care reform. John McCain also had a great day today really getting into it with Obama. McCain wanted to address issues in regards to the process and what went wrong there but Obama wasn't having it telling him "the election is over". All in all it was a great day exposure wise for Republicans. Was a lot accomplished? No, not at all. But we have to ask ourselves: Would the GOP have been able to put forth their proposals and let the American people hear them if we hadn't done this? No not at all. If this had been done on the House or Senate floor or in some closed door meeting on Capitol Hill the GOP would not have recived much media coverage at all. It also proved to the American people the the GOP is not just the party of "NO". Sometimes it is good to say no, especially at times like these we need to be saying no on things like spending etc., but in order to regain the trust of the American people we needed to show them our solutions which is what we did today. Today was a step abet a small one, but a step none this less and that is what we needed. The NRA has "officially" endorsed Rick Boucher for the 9th District election. Today, the President held his "Healthcare Summit" at the White House, inviting Republicans and Democrats to come to the table for discussion on a "bi-partisan" solution to healthcare. However, we are now seeing that the President's pledge to hear both sides of the isle has again not come to fruition. A "talk clock" was kept by GOP aids and they timed the President speaking for 119 minutes – that's 9 minutes more than the 110 minutes Republicans used. The Democrats consumed 114 minutes, giving them a total of 233 minutes. From the beginning, no one could agree on anything, even how much time each side had used. When a miffed Sen. Mitch McConnell, the Senate Republican leader, pointed out early on that Democrats had controlled 52 minutes to Republicans' 24, Mr. Obama jumped in to dispute even that. "I don't think that's quite right," he said. didn't count my time in terms of dividing it evenly." charge of the bipartisan discussion. statement. "No, no, no, no. Let me - and this is an example of where we've got to get our facts straight," he said when Mr. Alexander sought to clarify a point. The bitterness that underlies the contentious health care reform debate burst to the surface fairly quickly, when Sen. John McCain, who lost to Mr. Obama in the 2008 election, lectured the president about what he called a backdoor process to produce the Senate bill. "John, can I just say -" Mr. Obama interrupted. "Can I just finish, please?" Mr. McCain said tersely before continuing, refusing to yield the floor. fashion; it was produced behind closed doors." Clearly irritated, Mr. Obama furiously flipped through the pages in a briefing book in front of him as Mr. McCain spoke. When he finished, the president teed off on his former adversary. "Look, let me just make this point, John, because we are not campaigning anymore. The election's over," he said, staring at the Arizona Republican. Mr. Obama didn't smile as he continued to scold the senator. "We can have a debate about process or we can have a debate about how we're actually going to help the American people at this point. And I think that the latter debate is the one that they care about a little bit more." Annnd the icing on the cake – Sarcastic count #4. The president also took a swipe at Rep. Eric Cantor, Virginia Republican, who sat behind a 3-foot stack of papers - a copy of the legislation produced by the Senate. dripping with sarcasm. "When we do props like this, you know, stack it up, and you repeat 2,400 pages, et cetera, you know, the truth of the matter is that health care is very complicated. And we can try to pretend that it's not, but it is." In hour six, a moment occurred that summed up the bipartisan spirit that existed in the room. Listing the problems with the Senate bill, House Minority Leader John A. Boehner concluded: "I could go on and on and on." "You have," Mrs. Pelosi said with a tight smile. Our children and I went to a court case on Wednesday here in Bedford county, Virginia. Please read on as this case will impact every American by the time it's over. (I'll be as brief as possible.) While the case appears to be about a woman and her child, it's outcome may set a precedence that will allow for every American family to be destroyed by allowing the courts to separate biological "fit" parents from their children merely by request from a stranger who claims to be more"fit" than the current parents. In other words, if someone sees your child or grandchild and feels that he/she would be a better parent for any reason they could petition the court for custody of your own flesh and blood! You may have heard of this case for Lisa Miller, a former Lesbian who was joined in "civil union" to another woman in Vermont several years ago. While in the relationship, she was artificially inseminated and had a baby girl named Isabella. When the "civil union" ended, all the papers were signed in Vermont to end the relationship and Janet Jenkins (who still lives in Vermont) declined any custody of Isabella. Since the breakup of Janet and Lisa, Janet has since joined under civil union with another woman in Vermont. Lisa Miller moved back to Bedford, VA with Isabella. Lisa became a Christian and that's when it got interesting. All of a sudden, Janet Jenkins wanted visits with Isabella. The child she was never interested in before had become of great significance now, and the power struggle for custody in the courts began. This has become a highly charged case for the Gay/Lesbian community as they seek to prove that they are "legitimate" parents. However, the underlying result of the case is the potential to allow strangers to "steal" children, with the help of the courts, from their biological families without any real cause. This case isn't about a Lesbian's right to be a parent, it's about your right to your biological children. The courts have always favored biological parents over anyone else, even when parents are found to be "unfit" be it from drug addictions, abuse, neglect and so forth (as it should be). The courts are hesitant to give up any biological child unless the biological parents are unwilling to be rehabilitated. Often the courts guard and protect the biological relationships for years. Only as a last resort is the biological child appointed for adoption. Never before has a case been argued that a court should take a biological child away from a court declared "fit" parent and given to a "stranger" based on the assertion that the stranger be a "more fit" parent than the biological one. This is HUGE!!!! Should Janet Jenkins and the ACLU win this case, all of our children will be up for grabs from anyone who wants them! I discussed this with the Dean of Liberty University's School of Law, Mathew Staver, who represented Lisa Miller on Wednesday. He confirmed my assumption of the magnanimity of this case and it's possible effect on all Americans. 1. Please get the word out and educate as many people as you can about this case. 2. Please write to the Governor and Attorney General of Virgina encouraging them to get involved. Virginia has two laws and a Marriage Amendment that are being violated. We can fight Vermont but the leaders need encouragement to stand for our state's sovereignty and all of America's families. We need you to help us encourage them to fight for our "biological" children! Note that the official response from Cuccinelli's office has been that they have very little jurisdiction in this case, as they are to represent the State and its officials, not individual citizens. However, this case clearly is impeding on the very Constitution of Virginia (by allowing VT courts to violate our laws) and thus the state is in jeopardy here, as well as EVERY citizen of VA and ultimately the USA. This isn't a case any of us can ignore! Our families are on the line and you can make a difference before it's too late. Please help! As you drive by the Planned Parenthood building on Peters Creek Rd, for the next 40 days, you will notice people outside the building. The 40 Days for Life Campaign begins today, Wednesday, February 17th and ends Sunday, March 28th. A peaceful, prayerful vigil will be held from 7am to 7pm in front of Planned Parenthood on Peters Creek Road, Roanoke, VA. If you can help be a part, please stop by and stand with others in prayer. If you need more information you can also call Tresa at 389-2832, or email Shirley at joslin37@juno.com . You may also email me at rvhr@cox.net if you need some more information. Most importantly pray for an end to abortion. While we send you many email alerts when the General Assembly is in session and try to keep you informed of what is happening in Richmond, there is far more going on each day than we could possibly tell you about. Yesterday was a day, however, that I think tells a little bit of the story of what we do to protect our values and your family on issues that don't normally grab the headlines or get a great deal of attention. Late last week we were notified of a bill regarding Advanced Directives (legal documents that you can have that communicate your desires regarding end of life care) that was not as innocuous as it seemed at first glance. Often complex in their make up, bills that deal with these types of situations can be confusing and sometimes have unintended consequences. After a review of the bill by our policy team, we determined that the bill made it much easier for a hospital to stop end of life treatment on an incapacitated patient who has no advance directive and no family member advocating on their behalf. We then contacted lobbyists representing the groups promoting the legislation to let them know of our concerns. The bill had passed the Senate 40-0, so we had to stop the momentum. The bill was assigned to a House Committee on Health, Welfare and Institutions subcommittee. Yesterday morning just as the subcommittee was beginning, we negotiated a series of amendments to appease our concerns. The nine page bill was debated for an hour and a half as our concerns and those of several subcommittee members came to light. Because of the problems, in an unusual move, the subcommittee met again last evening. Again, we were in the room to ensure that the end of life issues we were concerned about were addressed. Even as we kept a watchful eye on the committee, a sub-committee member attempted to elevate the role that a “life partner” might play in end of life decisions. While the committee had little appetite for introducing new controversial issues into the mix, had they seriously considered this notion, we would have stepped in to ensure marriage continues to be an elevated institution in our public policy. After another hour of debate and discussion, a much improved (at least where we were concerned) piece of legislation that included amendments fixing the issues we were worried about was passed onto the full committee. Again, there were no TV cameras in the room and odds are the bill will never be noticed by the general public. But it is these bills that often times go unnoticed that can be most damaging to our values even if the intent of those involved isn't bad. We try to catch every one, but with over 2,400 hundred bills in the system, we miss one now and then. But when we don't catch them often times other legislators or lobbyists will let us know because they can count on us to stop a bill in its tracks and ensure it gets fixed. At our Richmond Gala last fall, Governor Mike Huckabee noted that it is the staff at The Family Foundation that does the work that few want to do. We read and review hundreds and hundreds of bills. We sit in subcommittee and committee meetings that can run for hours, negotiating and lobbying to make sure the bills do no harm to our values and our families. Not very glorious, but the reason we exist as an organization. Yesterday was a day where we were successful in our mission. Today begins another day. Charlie Crist and his campaign are incredibly desperate and may well have hit rock bottom. This week, two polls show Charlie Crist is losing by 18 points in the primary, while two staffers have deserted his campaign. Jeb Bush called his support for the stimulus "unforgivable." In response, Crist has reacted by going on national television to announce his intentions to smear Marco in the upcoming election. Meanwhile, multiple media sources reported this week on Governor Crist possibly running for the Senate not as a Republican but as an Independent. As a result, earlier this week, the Crist campaign leaked copies of Marco's American Express card statements from his time as a Florida GOP leader to at least one Florida-based media outlet. Given that no one had access to these records other than Marco and the previous, Crist-selected state party administration, copies of these internal documents could only have been obtained for them through the efforts of former Chairman Jim Greer and his team. The fact that the sitting Governor of Florida, who was elected as a Republican, would go on to leak private internal RPOF documents is outrageous and appalling, especially in light of the scandals and destruction left behind by his handpicked choice for Chairman. When Marco first entered this race, he was warned that there was nothing Charlie Crist would not do to save his political career. Now we all see how true that is. The Crist campaign is leveling every made-up charge and sleazy innuendo it can come up with. I am sure that before the day is done, Charlie Crist and his campaign will respond to this story with expressions of shock and outrage. Perhaps he will go on to profess his supposed longstanding adherence to transparency. We think this would be a wonderful opportunity for him to prove that. He should apologize for the irresponsible spending of his hand-picked state party leaders, former Chairman Jim Greer and Executive Director Delmar Johnson, and demand a full accounting of their spending. He should also call for an audit on the work performed for the party by consultants linked directly to him, as well as examinations into any direct or indirect contributions the party has provided, in possible violation of party rules, to his Senate campaign. On a day when Floridians are focused on finding a job, working hard to keep the one they have, or concerned about what may come of today's Obama Health Care Summit in Washington, it's sad that Charlie Crist has resorted to this type of campaign. It's especially sad when you consider the major challenges our nation faces. Send Charlie Crist a signal that you're not going to let him get away with it. Help Marco fight the smears. Donate today and help Marco fight back. Senate candidate and former Florida House Speaker Marco Rubio released a torrid letter Wednesday accusing Gov. Charlie Crist's campaign of leaking Rubio's state Republican Party American Express statements showing nearly $110,000 in charges over 25 months. The Miami Herald and the St. Petersburg Times, which obtained the records, listed several personal items found on the statements, including grocery bills and wine bought from a store near his Miami home. Rubio said he personally paid American Express $16,052.50 for nonparty expenses. "During this time I crisscrossed the state countless times for Lincoln/Reagan dinners, GOP fundraisers, and other party business. In all, more than half of my expenses were transportation costs: 40 percent for commercial airline travel and 14 percent for car rentals, tolls, parking and fuel," Rubio said." Everyone knows Charlie Crist has two options: 1. lose embarrassingly to Marco Rubio in the primary, or 2. switch parties. RedState today posted an article predicting option 2, saying that the evidence points to the fact that Crist may be turning to the blue side, or becoming an independent. He was caught having a private meal with VP Biden in Miami, and has returned to "embracing the Obama stimulus fraud" - I'd say that's pretty conclusive evidence. However, everyone also knows that before Crist switches, he's gonna smear Rubio like crazy. Well folks, the games have begun. Today it was discovered that Crist took Rubio's private credit card records from the Republican Party of Florida and leaked them to the press. Although Rubio has only used the cards to help get Republicans elected within the state, he also used them for several personal expenses. What Crist did NOT elude to in the leak, was that every single one of those personal expenses were reimbursed to the state by Rubio. This is yet another example of how "Republicans", e.g. Arlen Specter and Charlie Crist, will do anything to get elected with little concern for their values and constituents. If Crist becomes an independent it will be concrete evidence that his Republican title was all for show. Breaking news: Senator Chuck Colgan, president pro tempor of the VA State Senate [also the longest serving senator in the state], is saying he mostlikely will not seek reelection in 2011. "I'll probably not run. I'm not Strom Thurmond." Some are skeptical of this announcement, given that he has said he "will not seek reelection" twice in the past, only to be convinced otherwise by Mark Warner and Tim Kaine. If Colgan DOES retire, who would be the best candidate in the district to run for the seat other than rising star Jackson Miller, currently a VA delegate. Bob Fitzsimmonds has also expressed his eagerness in taking on this seat again, and with both Miller and Fitzsimmonds in the running, it should make for a very competitive primary. BVBL has a complete list of possible candidates on both sides of the isle. With nothing for Colgan to lose, and no Democrat Governor to convince him to stay, it should prove to be an interesting race for the 29th district. We now have the same capability for Remote Phone Banking that Scott Brown used successfully last month in Massachusetts. If a Republican can win in Massachusetts with Remote Phone Banking, then we can definitely win with it in Fairfax County. Go to www.RPV.org/HD41 and check it out now! Please help Kerry Bolognese in the special election for District 41 by making 41 phone calls from your own home. All the data will be automatically saved and you don't have to write anything down. After years of trailing the Democrats in technology, Republicans have finally caught up. Simply go to www.RPV.org/HD41 and sign up. Once you sign up, log-in information will be sent to you via email - and you can call from the comfort of your home. Kerry Bolognese ran for this same seat last year and only lost by 209 votes to an entrenched incumbent. Can you make 41 calls from home to help Kerry? This special election on Tuesday, March 2nd will be all about turning out the Republican base. You making 41 phone calls will help put Kerry over the top in the 41st District this year. Voters are tired of answering the phone to recorded messages. With only a few days left until the March 2nd special election, every personal phone call we make will have a huge impact. Please go to www.RPV.org/HD41 right now and sign up. To quote Solovskoy about his resignation from the McPadden campaign: "Through the time and effort I have discovered that liberty to some is not necessarily what liberty is to others. Within the liberty movement there is a wing that seeks personal liberties that are contrary to the scriptures. As a Pastor I cannot affiliate myself with any ideologies that are in opposition to scriptures." Read his complete blog post on this matter. A source close to the McPadden campaign verified that it was McPadden and Solovskoy's differing beliefs in regard to homosexual "rights" that led to Solovskoy' resignation. New County Taxes on the Way? Virginia Senate Bill 280 has been passed by the Senate. If passed by the Virginia House of Delegates, it will allow county board of supervisors throughout Virginia to pass tax increases with a simple majority of the given board of supervisors. At present the board of supervisors in a Virginia county can only increase food and beverage tax by putting it to the citizens of that county in a referendum or in some counties by a unanimous vote of that county's board. Here is a flyer with more details tailored to Botetourt County. Thanks to Senator Smith for bringing this to my attention. When we ask, "Should we raise taxes?" - we are asking the wrong question. When we ask, "Should we lower taxes?" - we are still asking the wrong question. If we were to ask, "How much should we lower taxes?" - then finally we would be asking the right question. Until we learn to think Constitutionally, we will not be able to ask the correct questions. Greg Habeeb announced at the 6th District Committee meeting on Saturday that he was withdrawing from the 6th District chair race. You can read the details on his blog. No official word yet, but I wouldn't be surprised to see Greg run for Morgan's seat - assuming that Morgan defeats Boucher in the 9th district this November. (West Springfield, VA) –Kerry Bolognese, the Republican nominee in the 41st District Special Election, received the endorsements of both Fairfax County School Board members representing the district. Liz Bradsher, the member for Springfield District, and Tessie Wilson, the member for Braddock District, both endorsed Bolognese as the best candidate for Fairfax County schools. Bolognese is a Vice-President of the Association of Public and Land-Grant Universities, which serves public universities and research institutions in America, including George Mason, UVA and VirginiaTech. He has three children who graduated from Fairfax County High Schools, and a grandchild currently at Orange-Hunt Elementary. The special election will be held Tuesday, March 2nd. Polls will be open from 6 a.m. to 7 p.m. at their normal voting location. The 41st District of the Virginia House of Delegates includes parts of Springfield, Burke and Fairfax Station. The seat became vacant when then-Delegate David Marsden was elected to the State Senate. In what has to be one of the more crowded races for District Chair in the state, Danny Goad announces he is joining the race. Greg Habeeb, and Trixie Averill are both already running. As Chairman of the Sixth Congressional District I will work hard to strengthen the local units in accomplishing our stated goals and to grow the Party. The purpose of the Republican Party is threefold. First, we have an obligation to advocate the principles of the Republican Party and represent those electing us in our respective units. Second, we have an obligation to work hard to get Republican candidates elected to office. Lastly, we have an obligation to assist elected Republican office holders as they have need to attend meetings or otherwise assist them. I believe the Sixth Congressional District does a good job working on campaigns and assisting elected Republicans. By trade I am a Mechanical Engineer, licensed in two states, and hold an engineering degree from Virginia Tech and an MBA from the College of William and Mary. I am also a graduate of The Apprentice School at Newport News Shipbuilding. I am married and have six children. State Del. Morgan Griffith of Salem has taken a formal step toward becoming a Republican candidate for the congressional seat held by U.S. Rep. Rick Boucher, D-Abingdon, forming a campaign committee and releasing a statement of support from Republican state legislators in the 9th Congressional District. Griffith said this afternoon that he has not made a final decision to get in the race, but acknowledged that "clearly, I'm on the edge of a decision." Statements of support for Griffith's candidacy were issued in a press release with the heading, "Morgan Griffith for Congress." Griffith also said he has taken the steps to form the committee. But he said he wants to speak with more unit chairman in the 9th District before fully committing to running for the seat. Richmond, Virginia, 23 February 2010: House Majority Leader H. Morgan Griffith (R-Salem) received strong support to make the race for Congress today, as members of the General Assembly representing the 9th Congressional District in the Virginia General Assembly threw their support behind his possible candidacy. “Morgan has been a strong voice for Southwest in Richmond, and the values of the people of Southwest would be better represented if he were their voice in Washington,” declared Delegate Charles W. “Bill” Carrico (R-Grayson). Carrico was the Republican nominee against incumbent Congressman Frederick C. “Rick” Boucher (D-VA09) in the 2006 election. “Coal is the lifeblood of Southwest, and Morgan Griffith will stand up for coal and against the job-killing cap-and-trade scheme that would cripple our industry,” noted Delegate James W. “Will” Morefield (R-Tazewell). “Morgan understands how essential Virginia Tech and Radford Universities are to job creation, research and the economic viability of Southwest Virginia,” noted Delegate David A. Nutter (R-Montgomery). Earlier this morning, an announcement was made that will forever change the course of history. We couldn't control the announcement, and we (under this administration) couldn't control the product, but what we can control is our reaction. 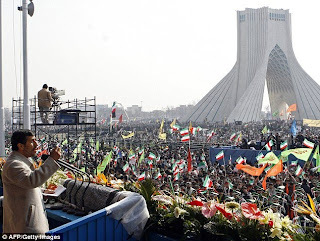 In front of tens of thousands in the Azadi Square, Iranian president Mahmoud Ahmadinejad announced that Iran is now a nuclear state. He further specified that Iran is now capable of "producing weapons-grade uranium" and "had produced its first batch of 20% enriched uranium, with the capability to enrich to far higher levels". "That indicates to us," President Obama said after the announcement, "that despite their posturing that their nuclear power is only for civilian use, that they, in fact, continue to pursue a course that would lead to weaponization, and that is not acceptable to the international community, not just to the United States." The President went on to say that the U.S. is preparing sanctions for Iran to "isolate them from the international community." Well Mr. President, I hate to tell you but 1) we've already tried sanctions, and they don't work and 2) this "isolation" is exactly what they WANT. So while we sit in our overstuffed lounge chairs sipping coffee and discussing how to "put Iran in time out (so that they can plot their revenge in private)", freedom minded Iranians are being oppressed in more ways than we can fathom - internet freedoms being taken away, rigged elections, free speech ban... the list goes on... all being enforced by a "violent" security force. The ball is in our court. Iran is waiting for our reaction. Will it be weak and ineffective (sanctions)? Or will we stand for our values and forcefully ensure that Iran is incapable of producing weapons of mass destruction? I hope the latter. What in the world does he think he's doing?! Does he hold any respect for his office? British Ambassadors used to refuse to bow to any foreign kings (much less a local MAYOR) out of respect for their country and the position they held. "The mayor of Tampa isn't a Third World potentate, totalitarian dictator, or terrorist leader so I can't understand why Obama would be in full-bow mode. 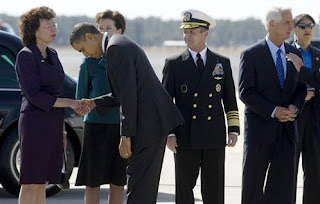 Is bowing now the standard way the President greets people these days? Is he misoriented, for some reason, and thinks Tampa is a terrorist stronghold or an enemy of the United States? Does the US owe Tampa a boatload of money and the bow just good business practice?" What has our country come to…?